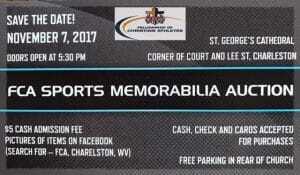 If you love sports like we do, then the FCA Sports Memorabilia Auction is the place for you! Hundreds of GREAT SPORTS ITEMS. Both silent & live auction items. November 7, 2017 at St. Georges Cathedral Church on Court St in Charleston, WV beginning at 5:30. Delicious food & drinks served and wonderful fellowship. But,the best part is raising money for Fellowship Christian Athletes – WV. Please call 304-344-9005 for more information. Only $5 for admission. Please try to attend and bring a friend. And please share this with your sports friends. Jim Strawn is serving as the auctioneer this year. Click here to view some of the items.